Yep, the hottest new Star Wars trend started out as "The Wolf Pack!" 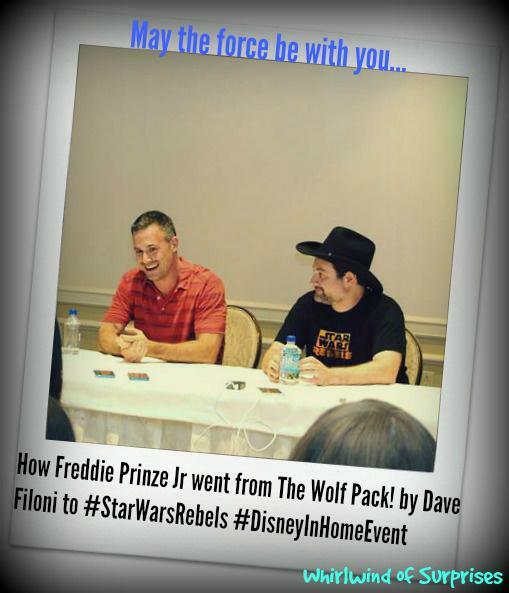 When Freddie Prinze Jr. first auditioned for the role of Kanan Jarrus, he saw the character breakdowns and thought "they're ripping off Star Wars!" His character had a Sun Sword and the script even had their own Wookie (sp?). In the end, it really turned out to be Star Wars Rebels rather than the Wolf Pack. How did the Wolf Pack originate? Well, then we turned to Executive Producer, Dave Filoni, who gave us a tour inside his mind and his love of wolves. Dave has a fascination and love for wolves, which is what lead to the temporary name The Wolf Pack during the non-disclosure part of production. His admiration for wolves has led him to do many things, including a tiny wolf pin adorning his cowboy hat during the interview. Dave has traced the wolves back to Never Cry Wolf by Carroll Ballard in film history (1983), also coincidentally a Disney film. He's even flown up to the Northwest Territories in his free time after the Clone Wars movie premiered for a week and a half to observe and study the wolves, their ecology, and their survival as an endangered species. That in itself was pretty admirable. However, what impressed me wasn't just his dedication to the wolves but the reason and philosophy behind it. Dave Filoni believes that the wolves as predators have always been mislabeled as violent/aggressive creatures but they play a big part in ecology. Suitably, he loves the Wolf Pack Clone Troopers in Star Wars. The point is he believes in kids learning about the things around them to discover what they really are instead of judging things at face value. Speaking of exploring and not judging things at face value, we brought up the discussion of strong and intelligent female characters in Star Wars Rebels. Dave says it's a necessity these days to use a female lead, to which I would agree. Freddie was quite vocal about this topic as well and was quick to point out that Clone Wars was a good example to show a good variety of young and old female protagonists and antagonists. I have to say, I especially loved that he said "Lea's in a dress but she's tougher than the guys in all the movies. All of you are in dresses. I'm sure some of you can whoop on us." To that I have but one response, "Hell yeah!" Dave describes Hera as the character with the Hans Solo lines. In his words, he "gets schooled daily at home" and she is his muse when it comes to developing female characters -the way they look, walk, talk, and even right down to the costume design. It felt as though the wolf pack mentality helped to choose the cast of the Star Wars Rebels. Dave was looking for people who worked well and would be able to collaborate well together and that is exactly what he got. So, I guess Freddie passed the test but he still doesn't get his much wanted blue light saber from Dave! Perhaps the most surprising part of the interview was Freddie. We all know Dave Filoni's passion for Star Wars. Duh, he's the executive producer. I never realized how big of a Star Wars fan Freddie was. He was telling us about a story when he was about 4 years old and playing Star Wars as Luke while going down a slide with a broken flag pole and ended up with a battle scar on his chin. It has now been 34 years of Star Wars fandom. See the newest addition to the Star Wars Legacy, Star Wars Rebels -Spark of Rebellion 1 hour special 11/3 at 9PM EST/PST on the Disney Channel and the series premieres 11/13 on Disney XD at 9PM EST/PST. May the Force Be With You! 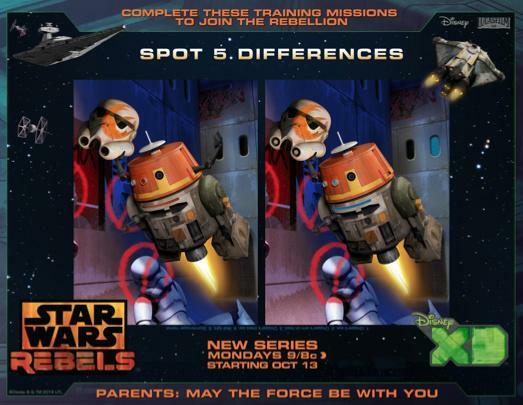 Click the image below to download some awesome Star Wars activities courtesy of Disney!